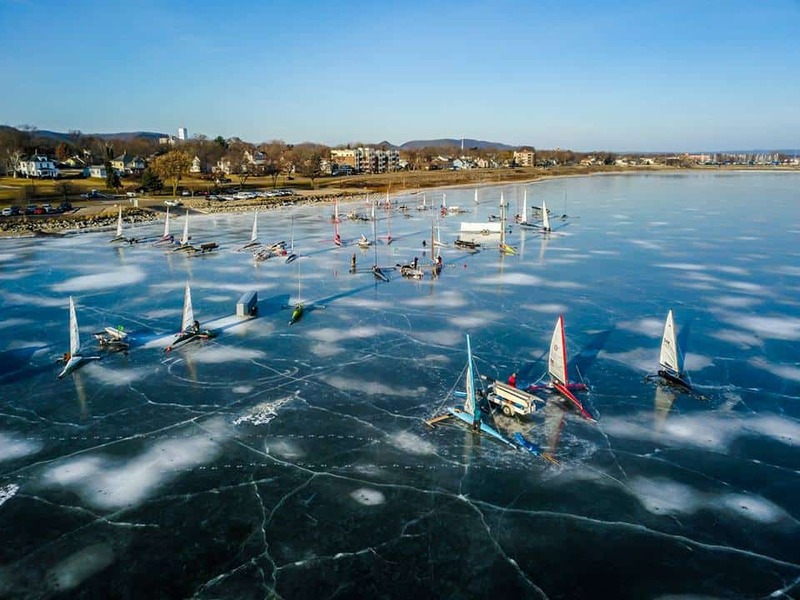 International Renegade Ice Yacht Racing Association. 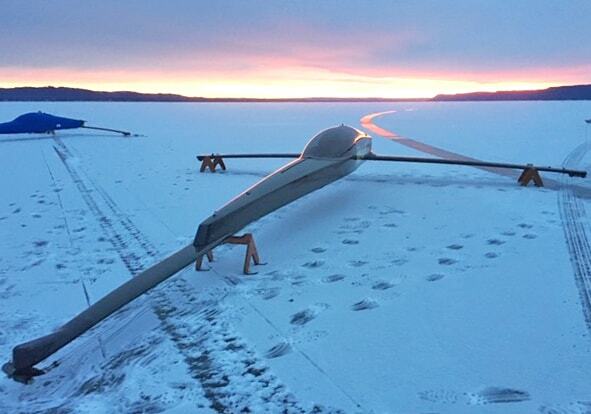 Affordable One Design Ice Yachts. 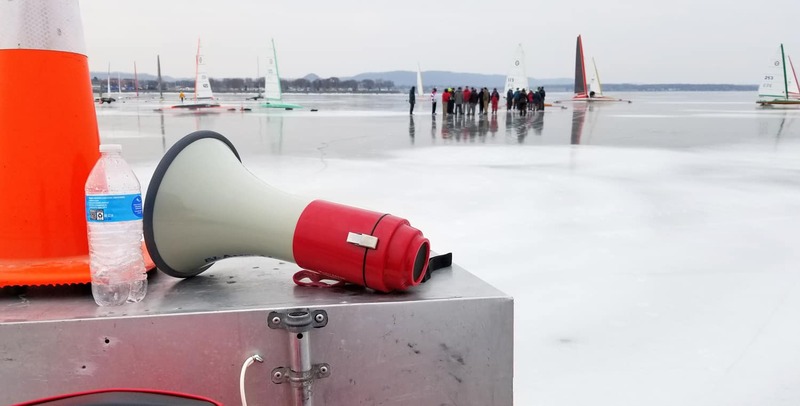 Elmer Millenbach’s timeless design introduced much of what modern ice yachting is today. 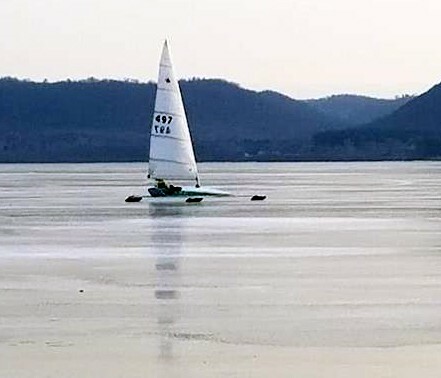 The IRIYRA was formed to promote the Renegade ice yacht. The Renegade is an excellent boat for those seeking spirited on-design racing. It has been a winner and trend-setter ever since its unveiling in 1947, providing many of the design features found in today’s Skeeters. The Renegade bears 67 square feet of sail on a bendy wing spar, making it a powerful racing yacht in a small package. It is compact and light enough to be car-topped. The local Renegade fleet has seen tremendous growth as many skippers move to perhaps the fastest of the one-designs. For more information on the Renegade class, contact the Renegade Association. Detailed plans are available on this webpage in the links above or from the IRIYA (for a mere twenty bucks). 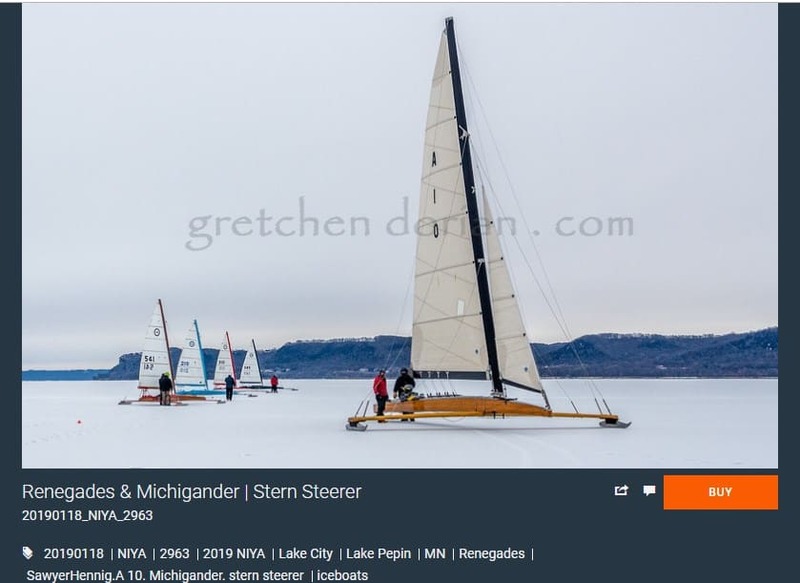 Iceboat photographer specialist Gretchen Dorian made the 9 hour drive from northern Michigan to photograph the Northwest, one of her favorite regattas. She set up camp at the weather mark in brutally cold conditions on Saturday and somehow managed to keep the batteries and cameras working. Her first set of photos have been posted on her website. Take a look and stay tuned for more. Provisional Results Back in from an an extremely cold day with light to moderate breeze, enough too power through the snow. It started out light and built throughout the day. All fleets now have 3 races completed.The Northwest had a first today, the mayor of a town where we are sailing joining in to race. 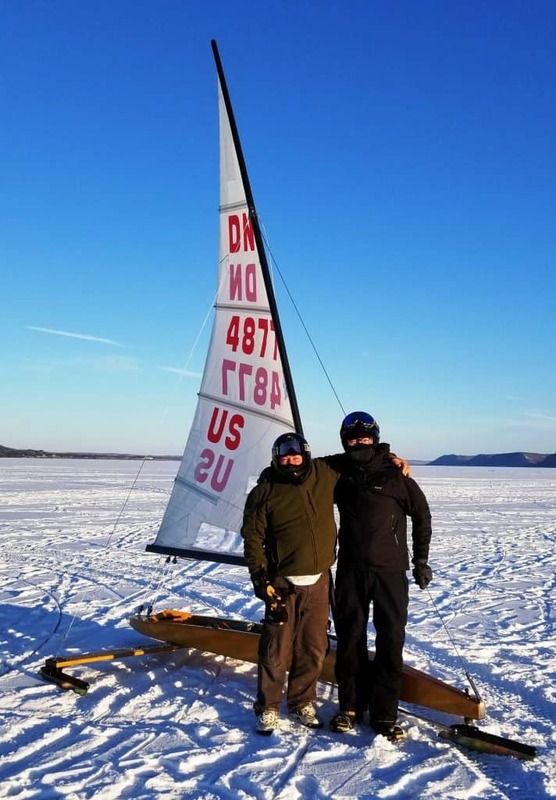 Lake City mayor Mark Nichols races soft water boats and raced his first iceboat race today. Off to the banquet. We were able to get 4 races in before the snow came. The DNs, Renegades, the A Skeeters, and the Stern Steerers sailed in light to moderate shifty conditions on 1/4″ snow covered ice. Visibility soon diminished as the flurries arrived and persisted causing racing to be postponed until tomorrow. 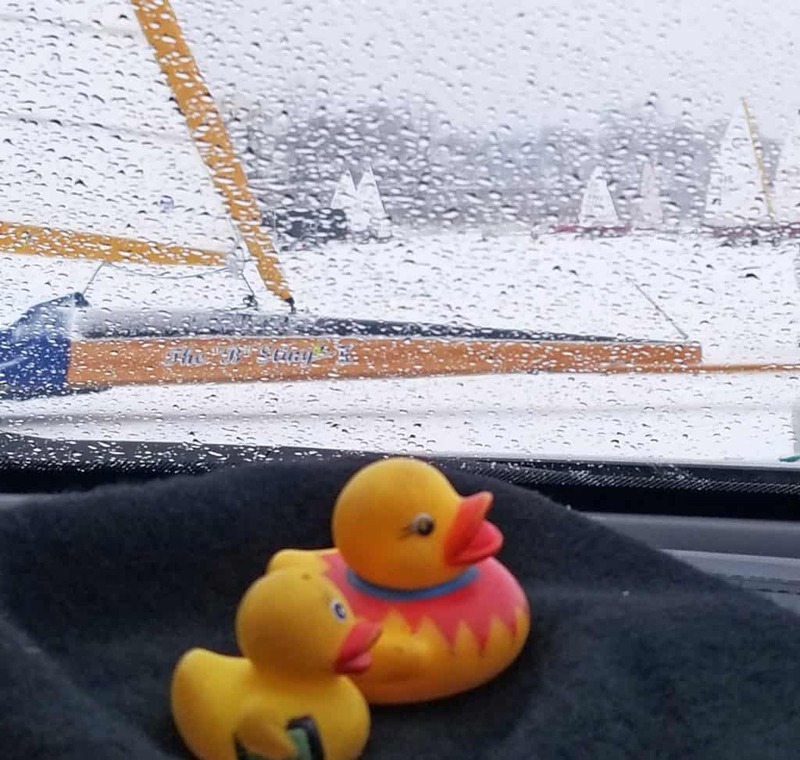 We are hoping the flurries end without ending the regatta. Stand by for tomorrow’s update. During the regatta, Mary Jane Schalk will be continually uploading Northwest fleet results like she did for the ISA. Check the link often because she tabulates after every race. In the meantime, check out the list of competitors at the Results link. Please note that the finishing procedure for the One Design classes (DN and Renegade) and the Skeeter Classes must conform to their respective rules per the NIYA By-Laws. Since all of those Classes currently specify use of the Bart rule, that method will be used for 2019 and future NIYA Regattas. The Bart rule method of finish will not be used for the A, B, C, and D class Stern Steerers sailing in their combined race. There’s a fairly obvious pressure ridge about 1/3 of a mile south of the launch. Do not sail to the Willows because of open water. There’s about a 2 mile x 2 mile sailing area. Don’t go wandering off! When making reservations you must tell them you are with the ISA regatta. IMPORTANT: Must call the hotel directly at 651-345-9900 to get discount. No Expedia. Single condo rooms sleep 1 – 4. Thursday is $125.00, Friday and Saturday are $87.50. Double rooms sleep 6 -8. Thursday is $205.00 with Friday and Sat. $127.50. 2 Queen room (no view) 89.90 + tx. Single queen with a view $89.90 = tx. 2 queen handicap $89.90 + tx. 2 single King $99.90+ tx. Suite with 1 king and 1 queen separate rooms $109.90 + tx. See Sailing Instructions for more detail. Banquet at the Lake House Restaurant at the Willows. 7:00 PM dinner and order off the menu. 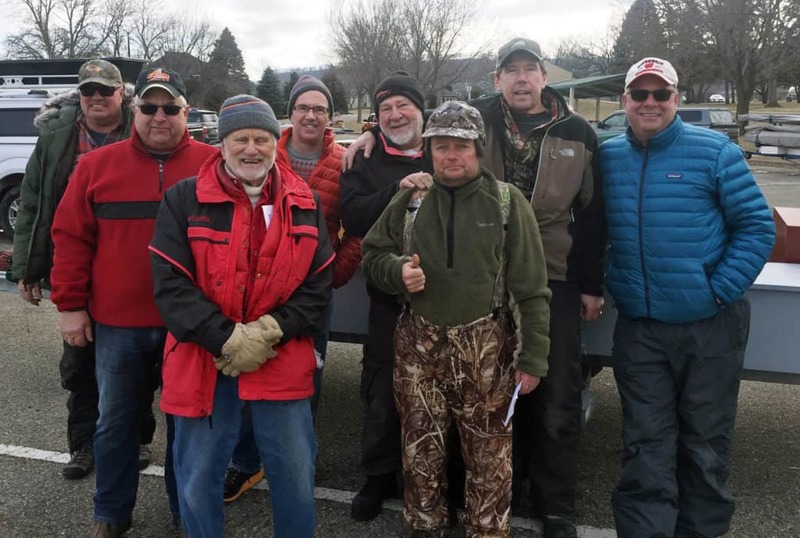 Renegaders – From left Scott Goetz, Jim Nordhaus, Greg McCormick, Don Anderson, Scott Shackelford, Jeff Russell, Jerry Simon, and George Gerhardt. Steve Schalk: ISA Secretary/Treasurer, course setting, flagging, and anything else that needed doing. Jason Thompson & the rest of the SIBC sailors who helped in any way asked. Mary Jane Schalk: Off site tabulation. She published race results at a blazing speed, even before the sailors had a chance to walk over to look at the line up sheets to see how they finished! She also contacted the hotels and arranged the banquet. 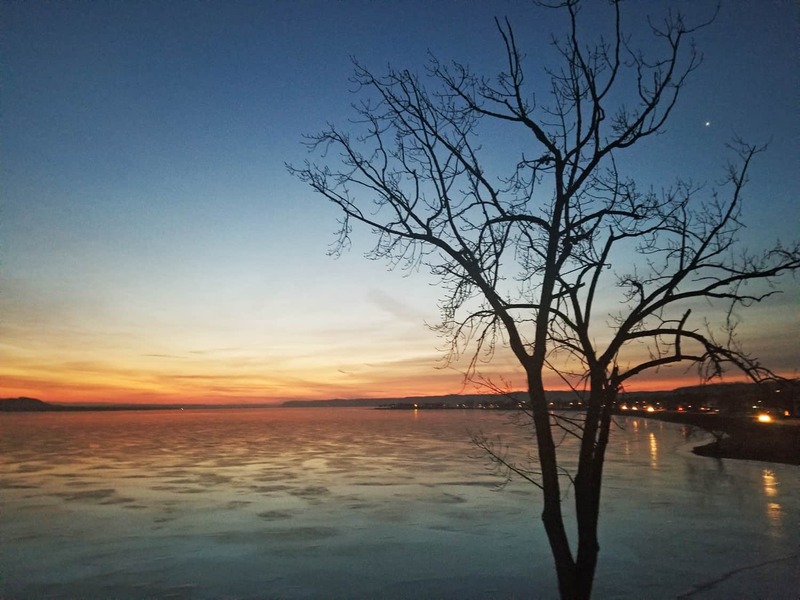 Julie Jankowski: Facebook video and photo updates which were much appreciated around the world. Steve Brown: Lake City resident and licensed drone pilot who shared his videos and pictures with all of us. Wayne Schmeidlin (Wayne’s Automotive on Cottage Grove Road, Madison) and his son, Adam, who not only tuned up our ATV but made sure my car was in good shape to haul it. We would not have had as many races without an ATV in good working condition. 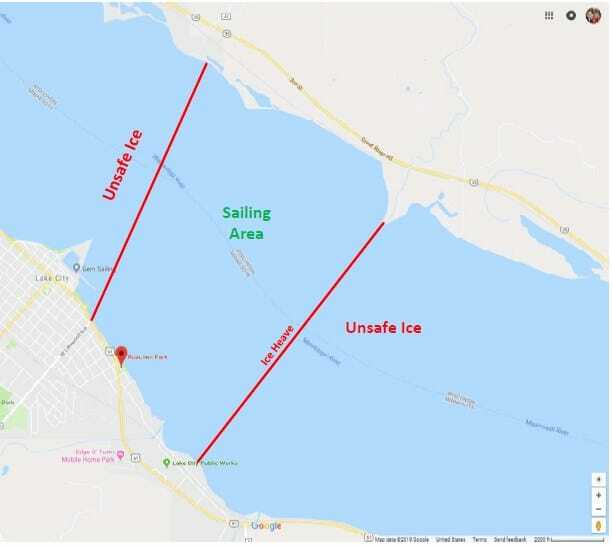 The people of Lake City, Minnesota who welcomed ice boaters for the second weekend in a row. It’s heartening to see them come to the landing to see what we are up to, ask questions, and take pictures. All four fleets for always being lined up and ready to race as soon as the last boat crossed the finish line. 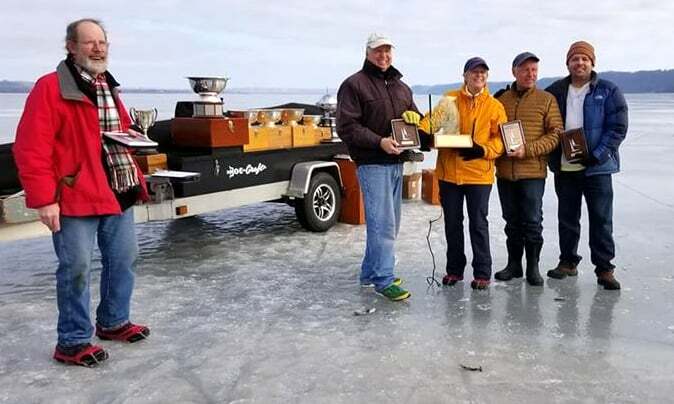 Lake Pepin’s titanium-hard ice provided one of the best ISA and Renegade Championships seen in years. The Renegades and A Skeeters had 7 races each which the B and C Skeeters and the Nites had 6, that’s a 26 race regatta, folks! Stay tuned for more photos and some well deserved thank yous. 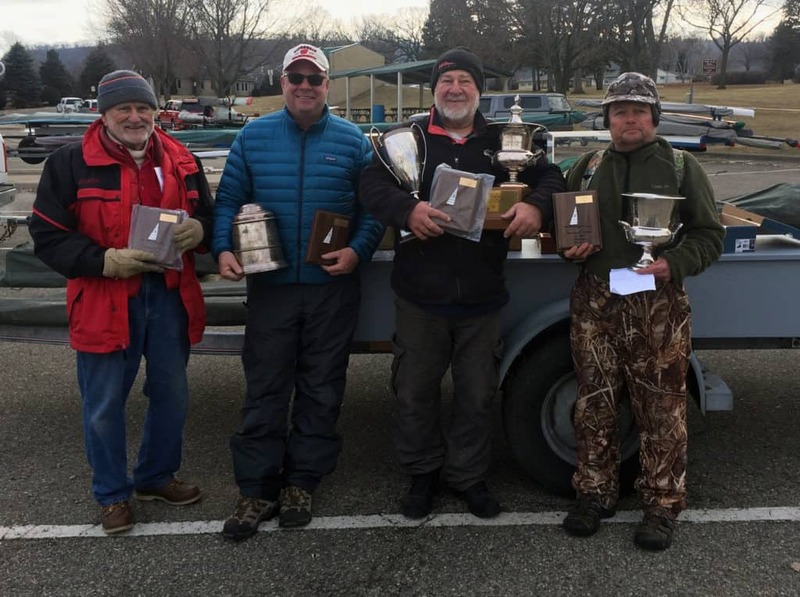 A special congratulations to Nite Class champion Maureen Krueger Bohleber who made history as the first woman to ever win an ISA fleet championship. Different conditions today compared to yesterday. It was cloudy with the shifty flukies in the morning and dead to juicy in the afternoon.Spectators were treated to hot battles in all fleets. Off to the banquet. Results here. Maureen Bohleber crosses the finish line in first in the third Nite class race. She currently sits in first place after today. Just back in from the lake. 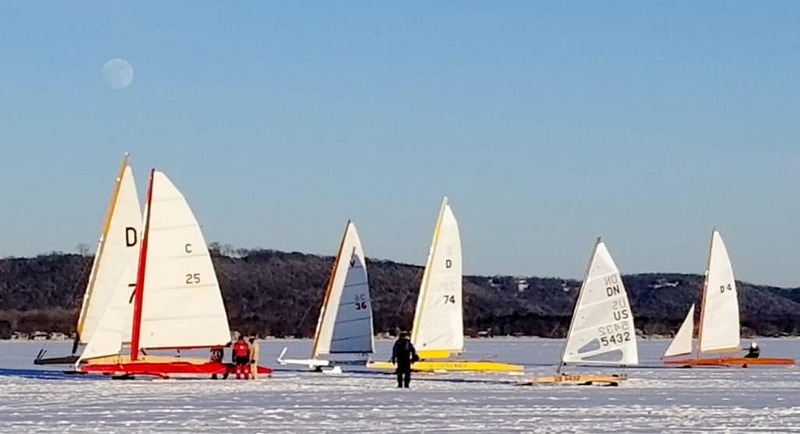 What a day – fast ice, a steady light breeze, a sunny day, eagles, trains, eight races, five classes, and Minnesota nice! Wish you were here. More to come tomorrow. Results here. Good morning from Lake City, MN on the first day of the regatta. Mary Jane will be tabulating from the home office in Fontana. You should be able to see results as they happen at this link. (Update: Link has been fixed.) The ice is hard and fast. Keeping fingers crossed for the right amount of breeze to make this a perfect regatta day. The racing starts at 10 AM and the rotation is Renegades, Nites, A Skeeters, and B Skeeters with C Skeeters. If you are a Facebooker, check out the 4LIYC page for live updates and photos.